The NTU Chee-Chun Leung Cosmology Hall was recently selected to the finalist for the World Architecture Festival Awards 2018 in the category of “Higher Education and Research- Completed Buildings”. World Architecture Festival Awards is one of the most prestigious honors in architecture. NTU Chee-Chun Leung Cosmology Hall gets to the finalist with its clear and brilliant design concept. 16 competitors, including many renowned architectural firms from Sweden, USA, UK, Turkey, New Zealand, Senegal, Saudi Arabia, Taiwan, will gather together in Amsterdam, where the result will be revealed on Nov 28, 2018. NTU Chee-Chun Leung Cosmology Hall is a generous donation made by Mr. Chee-Chun Leung, co-founder and vice president of Quanta Computer Inc. and a NTU Distinguished Alumnus, to house the NTU Leung Center for Cosmology and Particle Astrophysics (LeCosPA), founded by his earlier donation in 2007. LeCosPA is a center dedicated to the frontier research in cosmology and particle astrophysics. 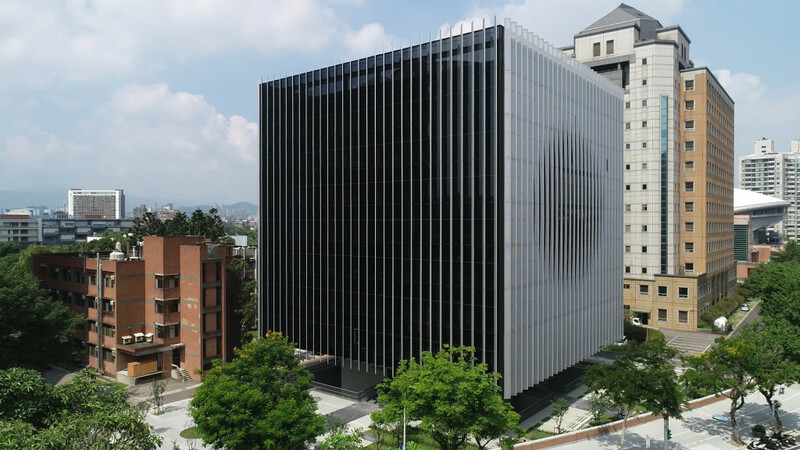 The new building is located at the intersection of Xinhai Road (辛亥路) and Jianguo South Road (建國南路) on the northern edge of the NTU campus adjacent to the Condensed Matter Science and Physics Building to its west and the Astro-Math Building to its east. The new building uses the cantilevered structure and semi-underground open space to create an impression of a floating cube when viewed from afar. Each tinted-glass facade of the cube is overlaid with vertical aluminum sunshading baffles where their inner sides are indented in arc shape in a progressive sequence, which creates a circular shadow at the center of the square facade that grows and shrinks in size as the viewer moves around the building. Entering the atrium of this four-fold symmetric building through one of the four bridges cross over the sunken plaza, one is underneath an eight-story-high dark-blue colored tube that opens to the sky and the bronze statues of four giants in cosmology, Zhang Heng, Galileo, Newton, and Einstein. Natural light pours through the skylight down on the perforated tube, which allows the surface text, a quotation from Zhang Heng’s cosmology, to emerge. It also brings vivid lighting effects to the hall and the corridors. Mr. Kris Yao, an internationally renowned architect and the designer of this building, comments that his design concept is “a floating cube with a circular void”. Prof. Pisin Chen, founding Director of LeCosPA, adds that, “This building reminds me of dark matter uplifted by dark energy”. Dark matter and dark energy are the two dominant components in our universe, contributing roughly 25% and 70%, respectively, to its total substance. However one interprets it, this building is without doubt very unique.